The Rochegude hotel proposes 9 comfortable bedrooms with parquet flooring, sleeping between 1 and 4 people, all equipped with air conditioning and sound proofing. The recent bedding includes a soft mattress overlay to guarantee a comfortable night's sleep. The bedrooms are available from 16:00 onwards, until 11:00 on the date of departure. To start your day well, we propose a complete breakfast including Viennese pastries, bread, butter, jam, yoghurt, cereals, fruit juice, coffee, tea, chocolate and milk, etc. A great way to get the day off to a flying start! Self-service newspapers and Internet access available. Please note that we do not operate our breakfast service on Sundays. However, we can provide you witha breakfast tray in your bedroom including fruit juice, madeleines, a piece of fruit or afruit purée. You can use the electric kettle in your bedroom to make coffee or tea. 6 bedrooms including 1 twinroom from 11 to 14sqm. 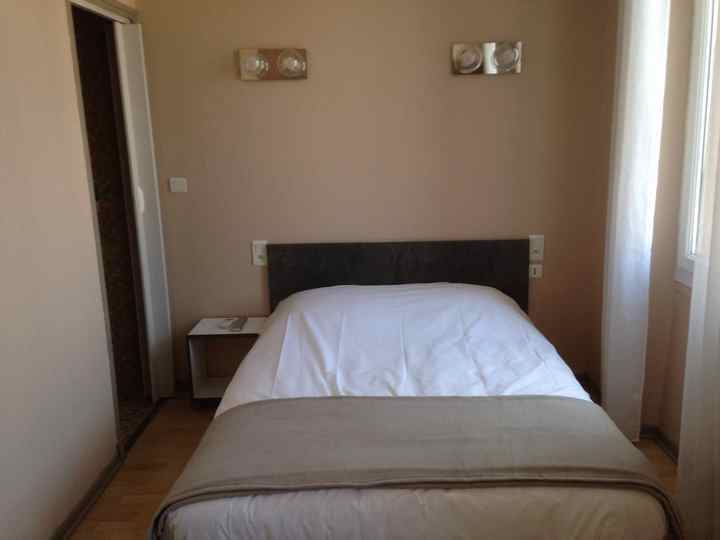 2 large bedrooms (15sqm) with a double bed and a single bed, for 3 adults or 2 adults and one child. 1 large room (17sqm) for 2 adults and 2 children, with air conditioning.